Did you know there was once a beaver that was two metres long? That the elephant-bird really did exist? And that the dodo once lived beyond the pages of Alice in Wonderland? Have you heard of the megatherium, the glyptodon or the tratratratra? of all ages could spend hours absorbed in the stories associated with the selection of extinct animals. Helene Rajcak and Damien Laverdunt have … used an informative and very accessible format to present what could potentially be very dry facts to a child audience … With its muted colours and full-page illustrations of fascinating beasts that no longer walk the earth, this book presents like an old fashioned bestiary. However, the creators are well aware of what will appeal to children. 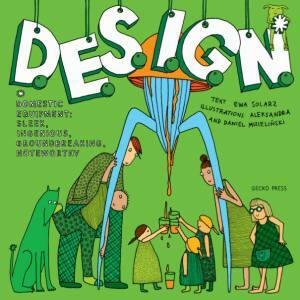 This book is full of good illustrations, and all sorts of information carefully pieced together. Funny cartoons tell more about animals that died out long ago and not so long ago. Earth was once home to some strange animals … Hunted by humans and weakened by climate change, these animals gradually disappeared. All that remains are footprints and fossils, explorers’ stories and fascinating folk tales. Mixing mythology and scientific facts this really magnificent looking book explores some of the exotic animals of the past … As well as detailed information about the animal, bird or reptile, each opening in this large book (320 x 250mm) also has a cartoon-like strip of more information about scientific discoveries and explorers. Although it is a sad subject when you look at the numbers of creatures concerned, a writer and artist with a real sense of humour and hope tell the whole `story’ for the future. 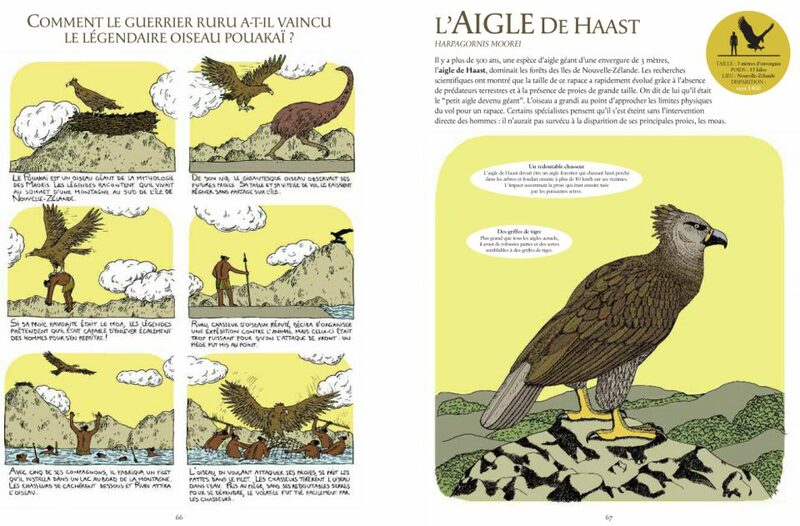 Small and Tall Tales of Extinct Animals is a … handsome record of 27 creatures lost forever, including our own Haast’s eagle – larger than any eagle alive today – and the moa. Along the way, it explores why these animals became extinct, and other issues surrounding endangered species. 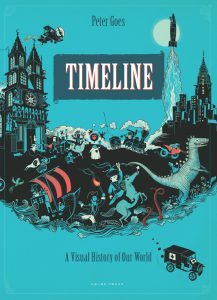 This fascinating journey around the world of extinct animals combines cartoons with naturalist drawings and mythology with science. 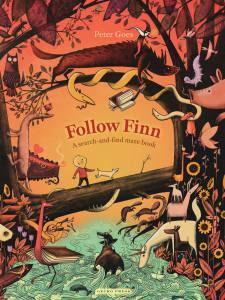 This beautifully produced English translation … features a world map showing the animal’s origins, a glossary and a timeline frieze and will appeal to curious 7-year-olds plus. Chances are you’ll both learn something from this educative book. This book is ideal for future scientists who don’t know their dodo from their moa. As soon I set eyes on it, I wanted this book for the cover art and design alone; it’s gorgeous, a book to be looked over again and again, and cherished. A book to keep for years. An appealing combination of fact and fancy…A handsome and useful work. This splendid, oversize encyclopedic study of extinct animals handles a potentially depressing subject without hectoring or mawkishness. Laverdunt strikes a companionable tone (‘The passenger pigeons’ migration wasn’t seasonal…. it was all about food’), while the quiet lines and somber palette of Rajcak’s drawings-well over 100-have a classic feel. Multipanel cartoons appear on the left, while full descriptions of each animal appear at right. The informal and often humorous cartoons take up some knotty issues in animal biology: ‘Ah, excuse me,’ inquires an ordinary deer during a discussion of the tremendous antlers of the extinct Irish elk. ‘Is this the international antler contest?’ Animal lovers will pore over this volume for hours, learning about how extinct creatures like the glyptodon were sometimes larger than their contemporary equivalents and sometimes smaller, like the Sicilian dwarf elephant. Still, Laverdunt and Rajcak don’t gloss over the cause of most extinctions (‘The moa… was no match for an enemy as destructive as man’), and the book’s message is unmistakable: when humans believe there’s an inexhaustible supply of a particular species, its future is in jeopardy. 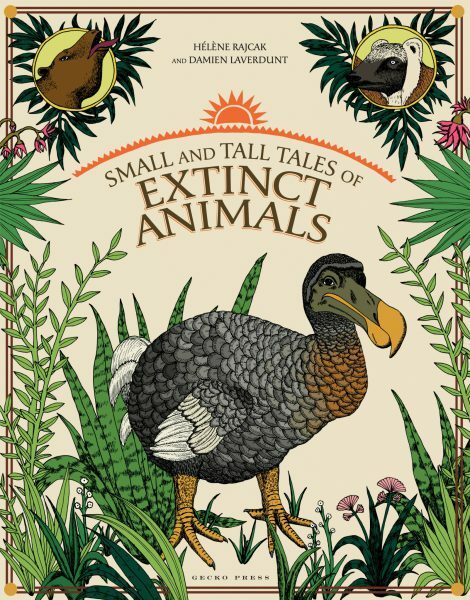 It is a less interesting world without the Dodo, the Giant beaver, the Great auk and the Tratratratra, but at least Small and Tall Tales of Extinct Animals provides an attractive introduction to the topic of endangered species, as well as a warning for the future. The double-page format of the Map and Timeline of Extinction ensure that they are legible as well as informative. The silhouette endpapers are simply a stunning work of art. When I read Small and Tall Tales of Extinct Animals … I found out about lots of animals I didn’t know about, and about where they lived and why they died out. The book is full of good illustrations, and all sorts of information carefully pieced together. Funny cartoons give more information about animals that died out long ago and also not long ago. The Chinese river dolphin became extinct in 2007 and many other animals, like gorillas and African elephants, are endangered. Extinction is often caused by humans or by the way humans change the environment where animals live. We need to take more care. The book is tragicomedy (blending tragic events with comedy). There are some strange and exotic creatures in this fascinating book. It also includes New Zealand’s moa and the Haast eagle. Details include size, weight, where the animal originated and the year it became extinct. An educational and fun book for children of all ages. The book not only offers a mine of information but also in itself is a tragicomedy that shows why conservation is important. It also shows that despite some of the best intentions of conservation, some species have always been destined for extinction, disappearing without the influence of humans. This is an entertaining, informative read for children interested in wildlife and some of the strange creatures that have become extinct. It just doesn’t get better than this when it comes to educational reads. Small and Tall Tales of Extinct Animals is likely to be my pick of kids’ books for 2012. It is an extremely beautiful, visual journey around a world of extinct animals. Be awed by the scale of some of these creatures; I just love the size comparison at the top right corner of each double-page spread. A child only needs to glance at it and he/she will be drawn into the book in wonder… I adore this book. It is beautifully produced in a large size, exquisitely illustrated, and utterly awe-inspiring. Every child should have one! If interesting facts are your thing, then you should adore the gorgeous Small And Tall Tales Of Extinct Animals by H‚lŠne Rajcak and Damien Laverdunt. The writers, who have been advised by the National Museum Of Natural History in France, have put together a (hardback) book which is exquisitely illustrated and full of weird and wonderful animals that are, alas, no more. A feast of fact and fiction, this collection of creatures from around the world who have not survived into modern times is utterly fascinating. The stories of how they lived and, sadly, how they became extinct are thought provoking; without preaching, the book raises awareness of the need to conserve all species that have survived. Some, such as the Woolly Mammoth, the Auk and the Dodo are familiar, but many others, including the rather terrifying Giant Beaver and the engagingly long-beaked Echidna, a giant Australian creature which flourished before people settled in Australia, are less well known. The role of humans in all of these stories is largely dishonourable; from what they learn here, readers can become responsible. Earth has been home to some quite amazing animals. Some, like the poor dodo, are quite familiar to us. Others, like the elephant bird and the tratratratra, may be less familiar. 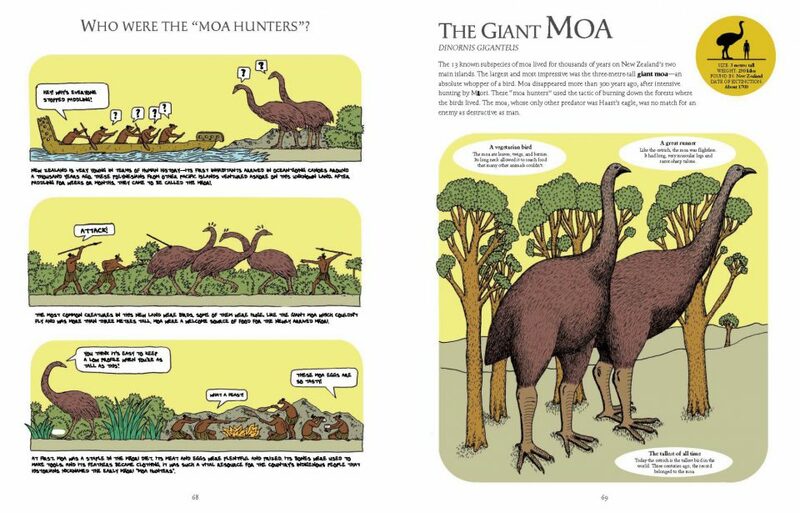 This unusual book uses pictures and comic strip style stories to tell us about all manner of extinct creatures, arranged by continent. The large format allows for the inclusion of lots of information and fascinating detail in the pictures. Fact and fiction combine to make a fascinating read – and remind us all that we must take care of all the wonderful creatures on our earth, especially endangered species. An interesting read for all ages. My daughter (5) loves this book, and I love reading it with her. The combination of fact and fiction accompanied by captivating illustrations is really engaging. The context and detail of each animals extinction inspire dozens of interesting and important conversations about the world and our place in it. OK so I shamelessly admit that I bought this book for myself. I love gorgeous, approachable non-fiction books and this is one such book. How could I resist? 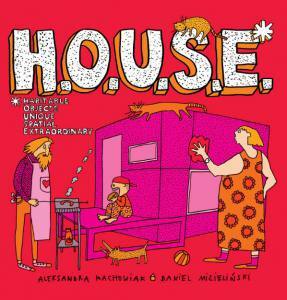 With illustrations that are at once accurate and yet somehow humourous, and with such awesome design that it blows other books right out of the water; this book is one to keep and to share with grandchildren of all ages. 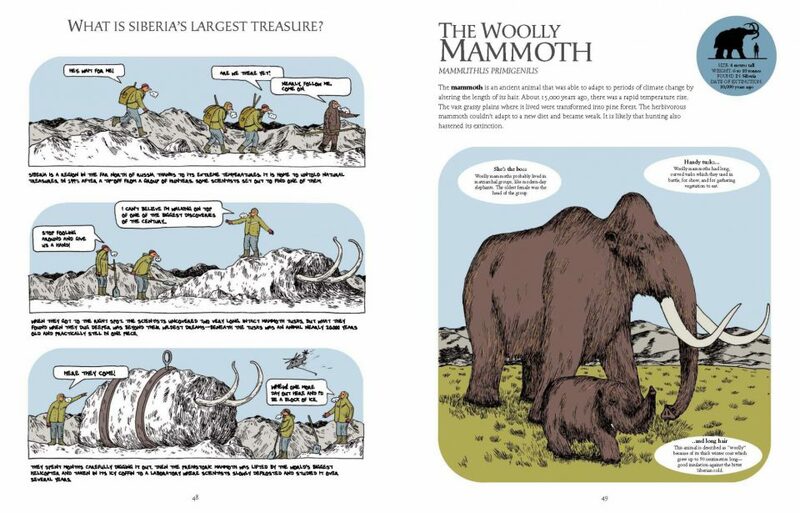 The delight is in the detail, with the inclusion of size comparison icons, easily digestible information, and on each facing page – a quirky cartoon about some aspect of the featured extinct animal that kids will adore. What’s not to love?